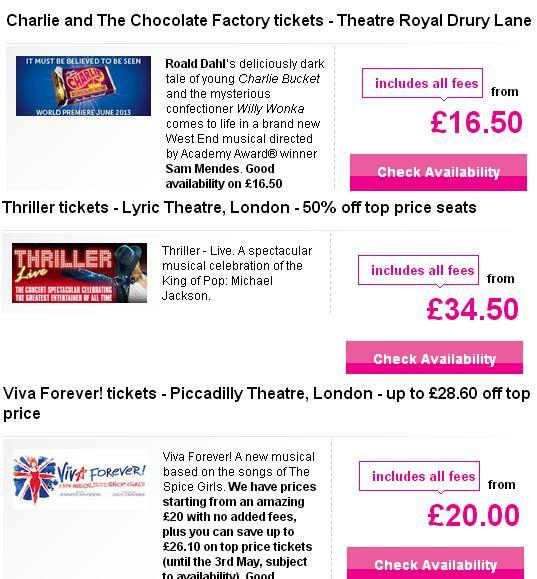 This is one thing I love so much about London- Musical ticket are so cheap!!! A much reasonable price for sure compare to when musical performs in Taiwan with seat faraway, and can’t see the whole stage with telescope, and can’t…etc etc etc. 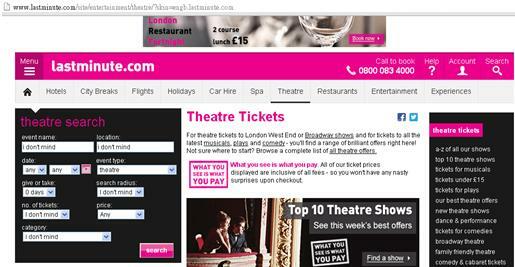 That’s why I went crazy and saw many musicals in London. An average price from 15￡– (huge), when in discount around 15￡-40￡ for a ticket, and with a pound or two for admin fee. Besides theatre can book your city breaks, spa..etc as well. I remembered I went to watch Ghost- 25 ￡ ticket+meal, and if only want to buy ticket during that time was 25 ￡ as well, so why not grab a dinner before the show start! Around 160￡ for 6 musicals+admin fee, that’ll be NTD8,000! Absolutely priceless since a musical in Taiwan with good seats always start from NTD3,000-NTD4,000 up! There are other classic ones beside above ones- The Lion King, Mamma Mia, The Phantom of Opera..and some that came out last fall or this spring. Sometimes the musicals are time limited, only shown during a period of time, so when in London check out shows you like before it ends! Prices vary of the time you purchase. I bought it when there was a promotion for 2012London Olympics drawing people into theatre to celebrate great summer fest in the evening, a 2 months special price tickets from 15￡. And of course in this website you’ll always fine great deals. No photograph allowed in the theatre, one musical for one theatre, the stage and the audience distance are close, you won’t complain about can’t see a thing, except performance in big theatre like Wicked having Z row(no worries about being too faraway, even a better view to feel the stage effect), and for The Lion, the witch and the wardrobe was held in the park in a circus tent! Beyond words to describe how awesome it was to watch musicals in different formats of stage, the sounds, lighting, and stories pretty much made me had tears in the end…this is to Les Misérables! Intermission was the fun part of all, there is a bar inside the theatre with people indulging champagne, and ice cream man selling boxes of ice cream in audience. It’s quite interesting, normally in Taiwan is no food allowed inside, no spilling, no this and that..well I guess it’s intermission fun time here in London!!! Don’t forget to stop by London WestEnd to embrace musicals! Next Next post: [PARIS] Bonjour le parfum à Paris!